Blister Sister Adventure Race Team | We're up for the challenge! I took the day and traveled to Toronto with Louise Smith to attend a press conference and join in on a walk for SMA. You may know that we have been fundraising through the Rebecca Run for Spinal Muscular Atrophy for 18 years to find a cure for spinal muscular atrophy. Glenis and I have been volunteering with race director Louise Smith since the race was in the planning stage. Although a cure hasn’t been found, a drug that can help slow the progression and in some cases give back abilities has been found and is in production. Although extremely expensive, to the point that basically no family can afford it, 43 countries and the province of Quebec have approved it for all SMA patients. Canada with the exception of Quebec has said no to all SMA patients. Only patients 12 years old and under who have never walked or are not intubated qualify. That leaves out children over the age of 12 and adults without access to this life altering, potentially life saving drug. I saw the pain in the parents’ eyes as they pleaded for their older children. These young adults worry about their parents just as their parents worry about them. To hear the university students explain how they manage living on their own, manage classes and manage their disability was astounding. How can Canada make a decision that will make it more difficult for them than it already is? Is it the cost? Are we not all worthy? I can’t comprehend Canada’s decision, but I will be there to help wherever I can to convince them to change their decision. Join us. The Rebecca Run for Spinal Muscular Atrophy is on July 6th at Fairy Lake in Newmarket, Ontario. I hope I see you there. Today presented with perfect winter running weather. Cold, calm and sunny. The footing was great considering how much ice was under the snow. An easy 14k, we haven’t officially started our training yet. It was beautiful out in the early day sun. Curiosity got the better of Sisters when we spied a spire peaking above a roadside hill. Up we went to see what was there and found a pioneer cemetery that was all but hidden from view. The Selby Pioneer Cemetery. We have driven and run by this cemetery countless times and had no idea it was there. Well, finding it warranted a good inspection by the sisters! We dusted off stones and tried to read the engravings. Most stones were from the mid 1800. Young and old people, husbands and wives and kids, from Scotland, England and Wales. We imagined what it would have been like back then, moving to a new country, what port would they land at? How did they end up in our area? All those thoughts started a great discussion for the rest of the run. We are always find inspiration when we run, just like this! We are still running and still finding adventures everywhere! Stay tuned! We went on a little outing today to Forget-Me-Not Alpacas near Beaverton. Beautiful animals. Sweet tempered, huge eyes! The farm is a beautiful set up for their herd. I had a great talk with the owners on building the farm, the herd and Alpaca husbandry. There went my goal of not adding to the yarn stash! I learned so much about raising alpacas there just might be a second career! 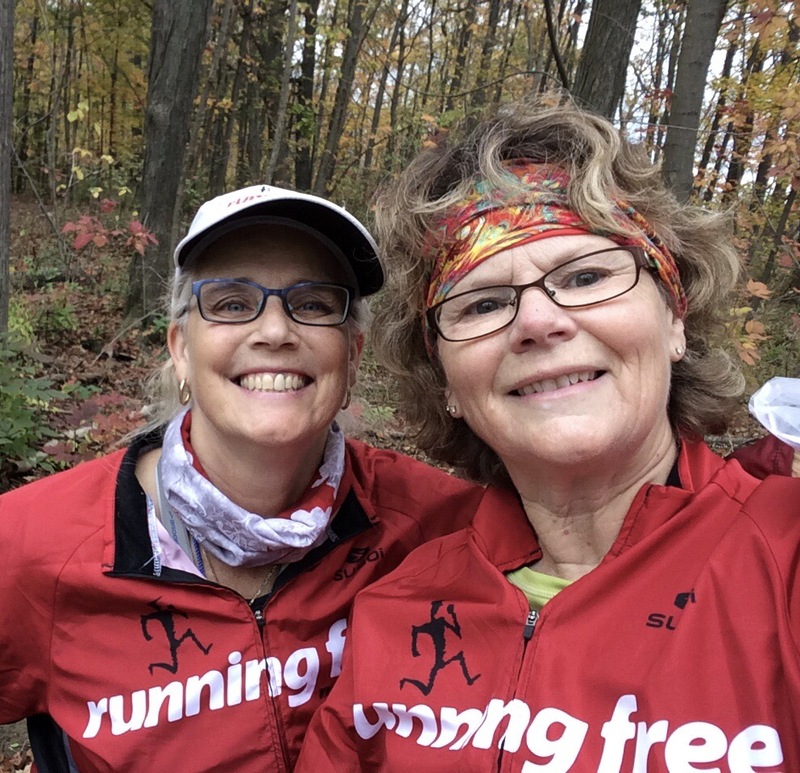 Glenis and I joined in a sweet little Fun Run put on by OUTRace – Ontario Ultra and Trail Run Series over by Creemore on Saturday. It was great! About 35 runners out for a lark on a sweet little 7.5k loop. The idea was to do 4 loops in 6 hours or as far as you wanted to go. 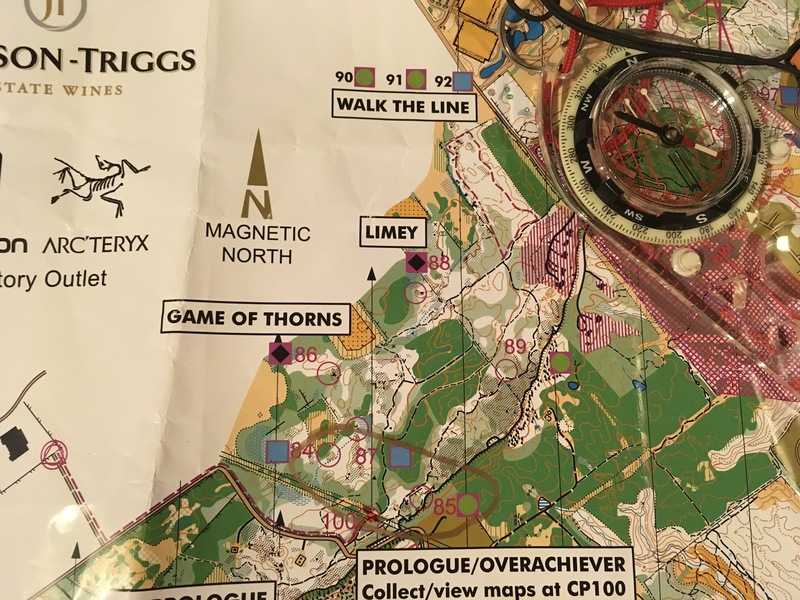 The course was challenging, with steep slippery up hill climbs on ATV trails, grass cover trails along alfalfa fields, slick down hills on single tracks and a couple of river crossings. It also had the BEST gentle down hill run ever on the back half. Oh ya and it rained a bit just to add to the best fun on a trail run! No points were awarded for this run but they had awesome awards at the end and everyone got a 30th Anniversary OUTRace toque just for showing up. Today I volunteered at the Rebecca Run for Spinal Muscular Atrophy. The run has been hosted in Newmarket for the last 17 years. I’ve volunteered for 16 of those years, the race just keeps growing. As always it was a beautiful morning of running, walking, families and adorable kids. The day featured a timed 5k, a 3k run /walk and a 1k kids run. There was something for every ability and the kids show you how to get it done. Hats off to Corey and her team for another great event and to Louise for starting it all! Today $115,000 was raised for research to find a cure. A gene therapy cure is so close but more research funds are needed to make this cure a reality. So many kids are waiting. Check out the website. Storm the Trent – in Haliburton! We had a blast volunteering at this years SST. We can’t wait until next year to join in the fun! Today was a beautiful spring day, but the store needed to be opened so we debated between running in or taking our bikes. Well, we really need the seat time so we met at the trailhead on our bikes and headed in. Did I mention it was a beautiful day? Along the trail we met George Biondic, the ultimate ultra runner and congratulated him on his new Canadian Record, over 900k in 10 days! What an accomplishment! We rode along, dodging downed trees from yesterday’s wind storm and rode up to the trailhead at Timothy Street. It was the first day of the farmers market and it was kind of busy in that area of town. Glenis was ahead of me and disappeared around the corner. The next think I know, she is on the ground! Crashed! Dare I say – again! (Last year riding the trail she crashed and broke her toes.) She rode up to the trailhead and hesitated a minute too soon on where to go next, off the curb or a sharp right on the walk way. That little hesitation crashed her into a huge railroad crossing pole! People came running! Oh boy, from all directions, almost cleared out the farmer’s market! Her hands were a bit of a mess and she rang her bell, but up she got. I grabbed both bikes and we wandered to the store. We had a look and realized she needed more first aid than was at hand so off she went to emerge. She’s always smiling. (Wait until she tries to knit!) Broken hand and cuts. I did mention she better get a waterproof cast! Storm the Trent is only few weeks away! A little mud, a few hills and a lot of fun! The Sisters joined in on the fun and participated in Don’t Get Losts Raid the Rib on Sunday. The event was held on the Niagara escarpment down near Niagara-on-the-Lake based out of Niagara College, a perfect venue for this event. Course is mapped out and we are ready to go! This was the first time we were able to participate as a team of two in a Raid. That meant we only had to look after one another throughout the run. Maps in hand and compasses security tucked away in our packs off we went. This year there were 4 controls you could find in any order that were not worth points called the spine and a number of ribs off the spine that were full of points to find. We planned our route and stuck to it. Picking off the spine controls along with some of the ribs. It sounds easy but we were running up and down the escarpment, through mud (lots of mud), rocks, boulders and brush. Up and down cliffs and through more than a few streams that flow off the escarpment. It was a blast! We found every control we had planned to find and even the bonus controls. After scrapping off the mud we enjoyed the barbecue and salads and Glenis even won some of the draw prizes! A great day! Bring on the next event – Storm the Trent! Last year was a bit of a bust for the Sisters but we are recovered, home, healthy and ready to go this year. We’ve been planning our season and our training for this year. We are excited to get started with Raid the Rib in two weeks down near Niagara on the Lake. Now that the weather has finally decided to cooperated we got some miles in on the bike today! After a summer of vacations and injury we finally got out for an adventure run at the Peak to Peak. It was Glenis’s first run after her little bike accident which landed her foot in a boot! She did great, I might have to stomp on her other foot to slow her down (just joking). We were pretty proud of ourselves, hitting all our planned CP’s until we came to the last one and I realized I had lost my SportIdent (my timer). I know I had it at CP84 but bushwhacking through thick brambles must have ripped it from my finger and it was gone when we arrived at CP 85! We even retraced our steps, or tried to, all the way back to CP 84. Standing at the control, neither of us could remember the exact way we had chosen to bushwhacked our way towards the next CP. With all the leaves on the ground, it was like looking for that needle in a haystack! A not so nice way to finish but we felt pretty darn good with our navigation and our first run event in months!